Review copy provided by the publisher. This book is nominated for a 2009 Cybils award. 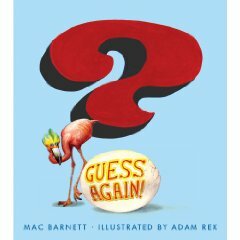 See how the cover for Guess Again! was designed on Adam Rex’s blog. Also reviewed by Kids Lit, A Year of Reading, Pink Me, Muddy Puddle Musings.